For the crust: Combine graham cracker crumbs, melted butter, sugar and cinnamon in food processor and pulse until crumbs are moist. Press crumb mixture into the bottom and up the sides of your temp-tations pie plate. Bake until crust begins to brown, about 8 minutes. Transfer to rack and cool while preparing filling. For the filling: In the bowl of a stand mixer beat the cream cheese and sugar until well blended. Slowly beat in flour. Blend in eggs one at a time, beating just until combined. Blend in sour cream and vanilla. Pour filling into crust. Place pie dish into a roasting pan and add enough hot water to come up on the sides of the pan about 1-inch. Bake cheesecake until just set in center and top is slightly puffed and golden brown about 45 minutes. Turn off oven keep door closed. Let cheesecake stand in oven 1 hour. Remove cheesecake from roasting pan. Refrigerate until cold; at least 6 hours. Cover and refrigerate overnight. 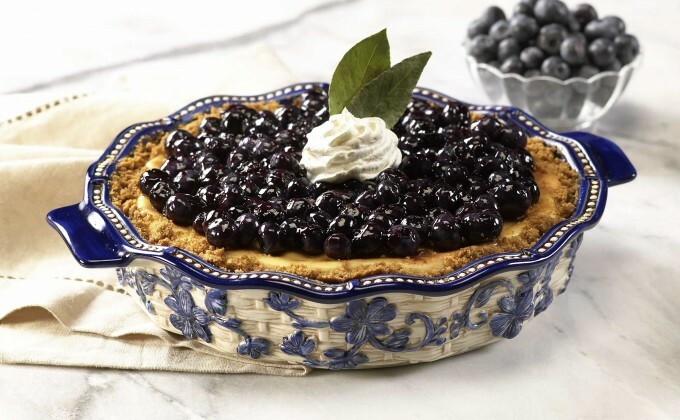 For the topping: Place blueberry spread in large skillet over low heat. Stir often until melted. Remove from heat. Add fresh blueberries and toss to coat. Spoon blueberry mixture over top of cake, spreading evenly. Chill until cold at least 1 hour.